A 14-year-old boy in Pakistan has been left badly injured after allegedly being set on fire because of his Christian faith. According to Breitbart, the boy known only as Nuaman says he was stopped in the street last Friday by two young Muslims who asked him which religion he belonged to . When he told them he was a Christian, they proceeded to beat him up and douse him in kerosene, before setting him alight. The flames were extinguished by passers-by but not before burning 55 per cent of his body. He is now being treated for his burns at the Meo Hospital, in Lahore, Punjab province. "I told them that I am Christian. They started beating me, when I tried running, both boys started following me through the street and then they threw kerosene on me and burnt me," he said. 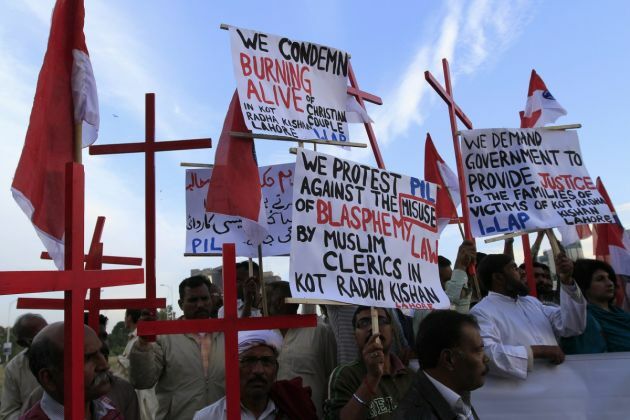 It is the second time in less than a month that a Pakistani Christian has been set on fire because of their faith. On March 20, 17-year-old Sunny Masih was beaten by a mob of Muslims and thrown into a lit kiln. He suffered severe burns but miraculously survived the attack in Sheikhupura District. Last Friday's attack may have been carried out in retaliation for attacks by Christians on Muslims in the wake of the bombing of two churches in Lahore on March 15, in which 17 people were killed and another 80 wounded. The bomb attacks sparked nationwide protests by Christians fed up with police indifference to the persecution being carried out against them. The protests took a violent turn and angry crowds attacked two suspects in the bombing, killing them before they could be interviewed by the police. Christians account for only 2 per cent of the population in predominantly Muslim Pakistan, and regularly suffer violent attacks because of their faith. Human rights groups claim police do little to protect them or hold perpetrators to account, and that the country's blasphemy law is routinely misused to harass and discriminate against Christians.